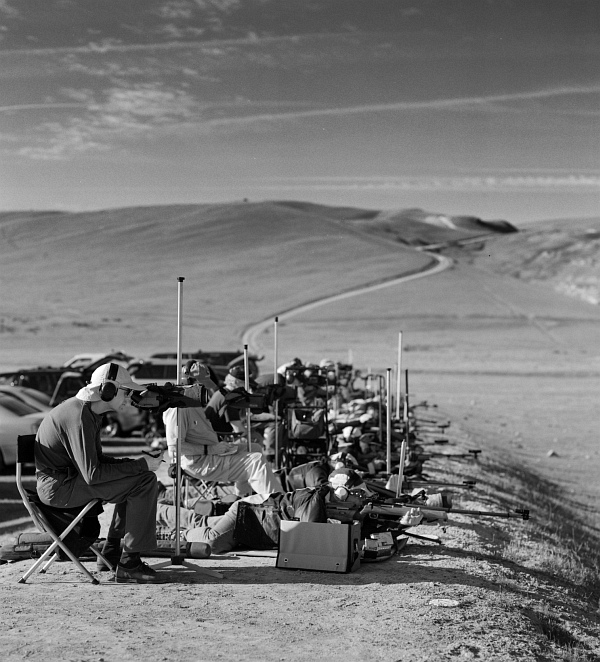 Coalinga Range in California. At dawn we could clearly see 7mm and .30 Cal bullet holes at 1000 yards. 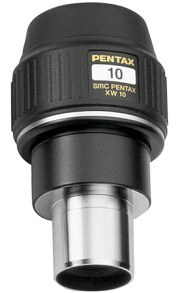 If you wonder why top-of-the-line spotting scopes (such as the $2980 Swarovski ATS-80 ) cost so much, the answer is that they will deliver even LESS chromatic aberration at long range and high magnification. 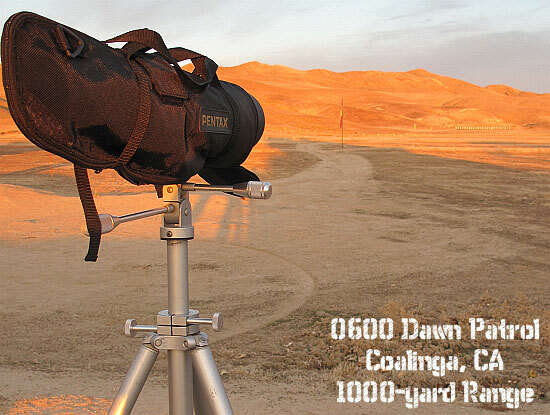 With their exotic apochromatic (APO), ultra-low-dispersion glass, a few ultra-high-end spotting scopes can deliver an image without the color edging you see in the photo above. 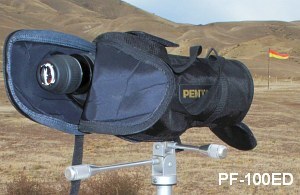 The Pentax PF-100ED is a heck of a spotting scope. Any scope that can resolve bullet holes at 1000 yards is impressive. But if you want the ultimate in optical performance, with minimal chromatic aberration, you may need to step up to something like the 88mm Kowa Prominar TSN-884 with Flourite Crystal lenses ($2450.00 body only), or the 82mm Leica APO ($3899.00 with 25-50X eyepiece). 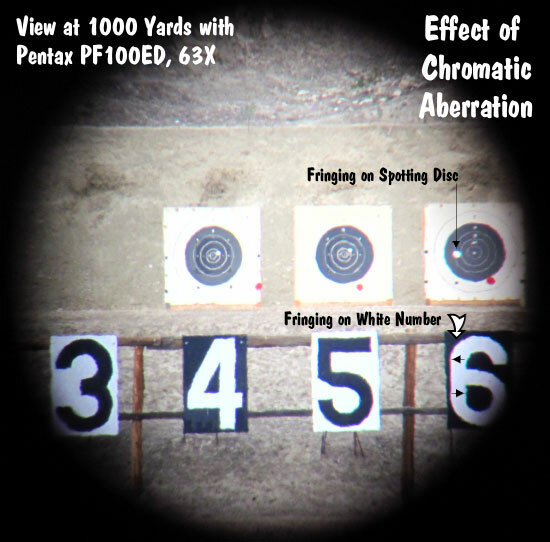 Share the post "Seeing Bullet Holes at 1000 Yards? 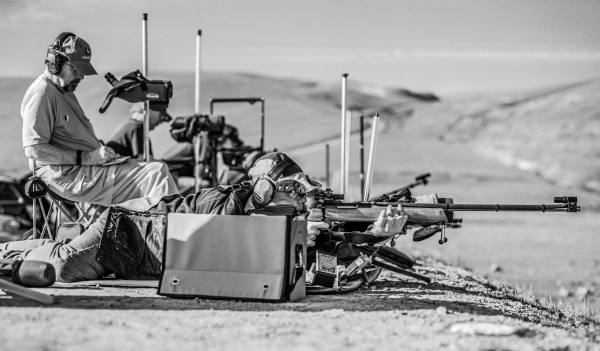 Yes It IS Possible…"
Here’s something you don’t see very often — a fullbore shooter with a .223 Remington topped a field of talented .308 Win shooters. Not only that, he scored more points than any F-Class competitor (however, F-Classers shot a smaller target). 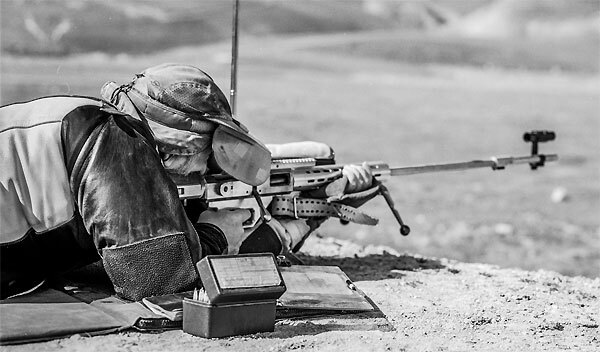 Bob Gill’s performance proves that, even in an era of high-BC .308 bullets, the little .223 Rem cartridge can still hold its own in the hands of a great shooter. 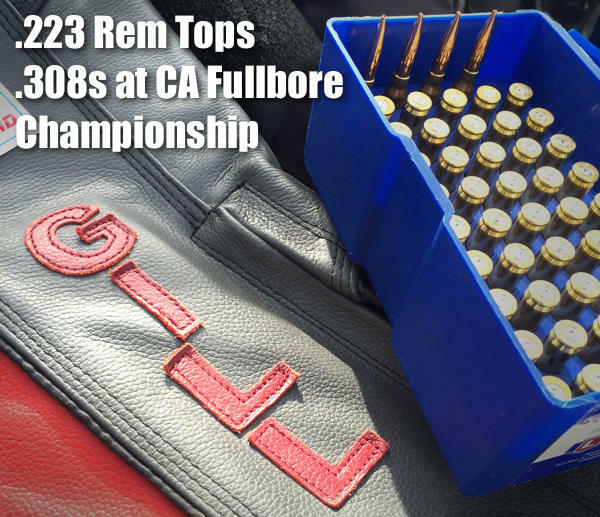 At last weekend’s California State Fullbore Championships, Bob Gill bested over 30 competitors for the championship with a .223 Palma rifle, only dropping 7 points over the weekend for a 993-56X. 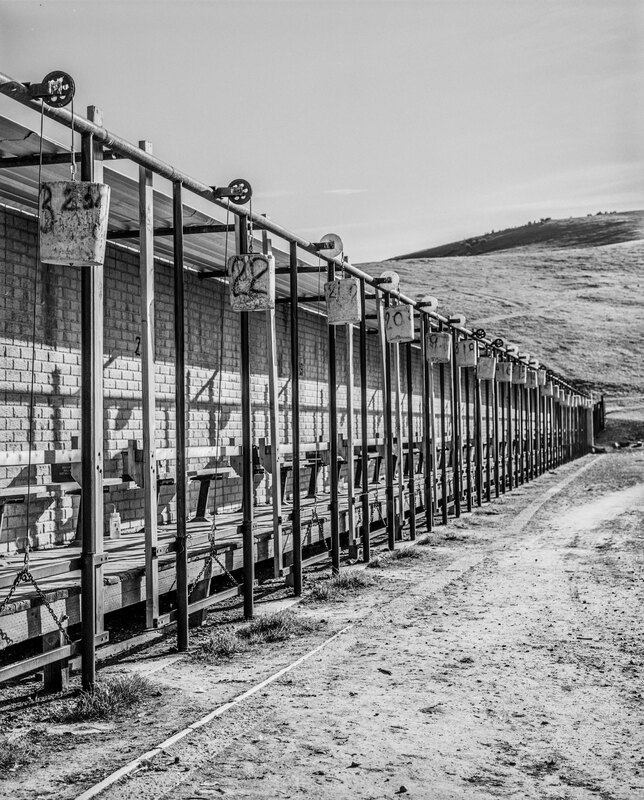 The event was sponsored by the California Rifle & Pistol Association and hosted by the Coalinga Rifle Club. 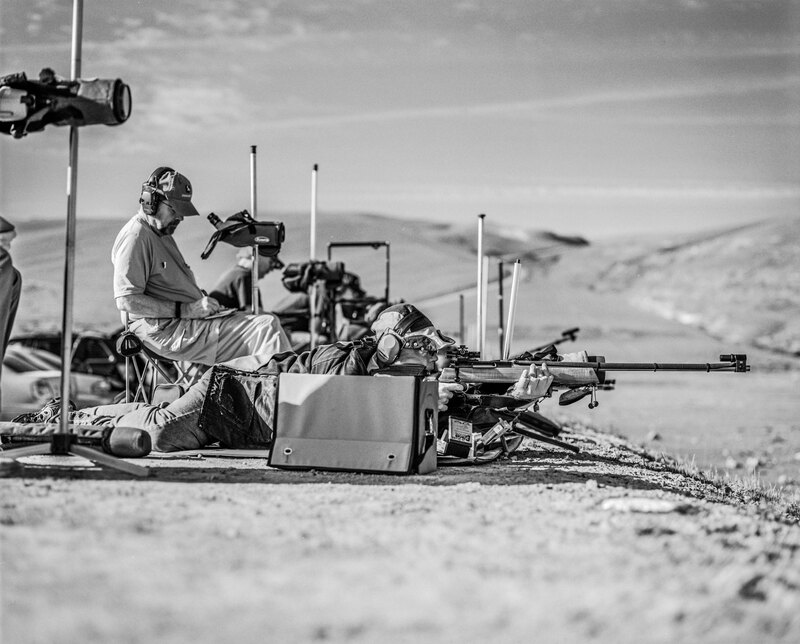 Conventional wisdom when shooting any match is to just stay focused on each and every shot and let the scores work themselves out after all firing is complete. 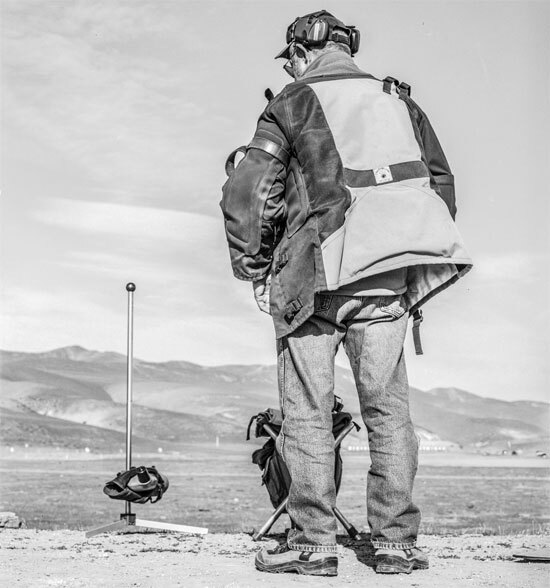 “Two To The Mound” shooting changes all of that, as each competitor is not only aware of their own standings throughout the course of the match – but also of their closest competitor during these pair-fire strings. With this championship never further out than a 2-point lead throughout the weekend, stress was high and every once of mental focus needed to be tapped. 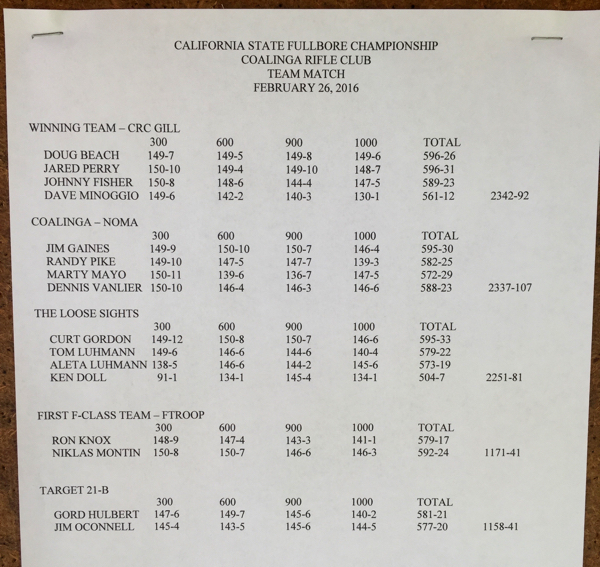 Three 10s later, Bob won the CA State Fullbore Championship by one point and one X. Well done! 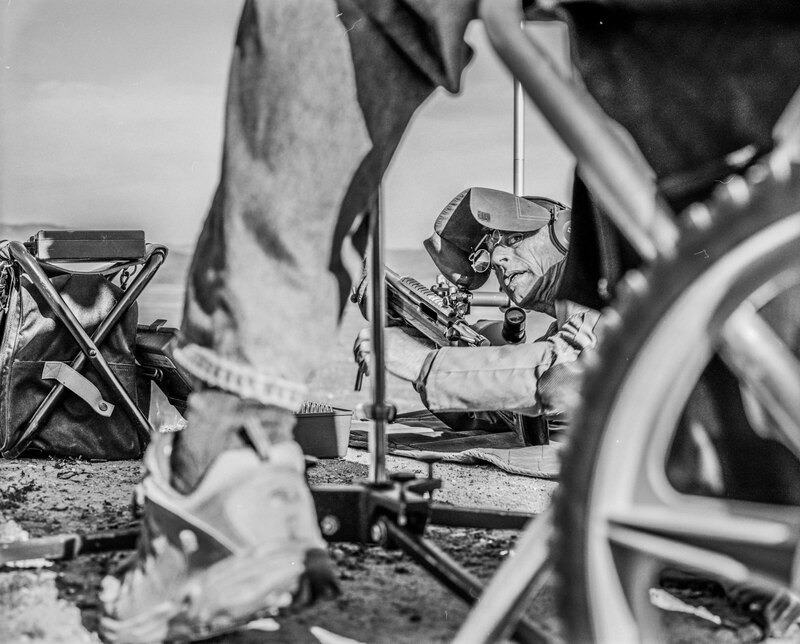 Bob was shooting a 1970s-era .223 Remington B-40X action inside a Competition Machine R1 chassis. The barrel is a 30.5″ Heavy Palma taper, 1:7″-twist Brux with a Wylde chamber and .220 freebore done up by Randy Gregory at Accuracy Unlimited. The Tubb 7T7 two-stage trigger was set at 1 + 1 pounds. Gill loaded 90gr Berger VLDs in front of 25.0 grains of Hodgdon Varget powder, jumping 15 to 20 thousandths for a 2.708 COL with a BR4 primer inside Lapua brass. 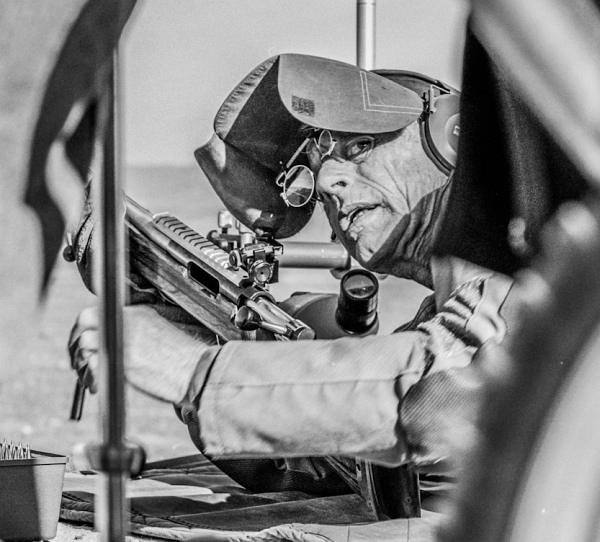 Bob uses a Redding Full-Length S-Die to push the shoulders back .004 to match that of new Lapua brass and a bushing chosen to achieve .004 neck tension. He sorts his brass by weight into 0.5 grain lots and each piece is trimmed on a Giraud trimmer after sizing because he says “it grows like crazy”. 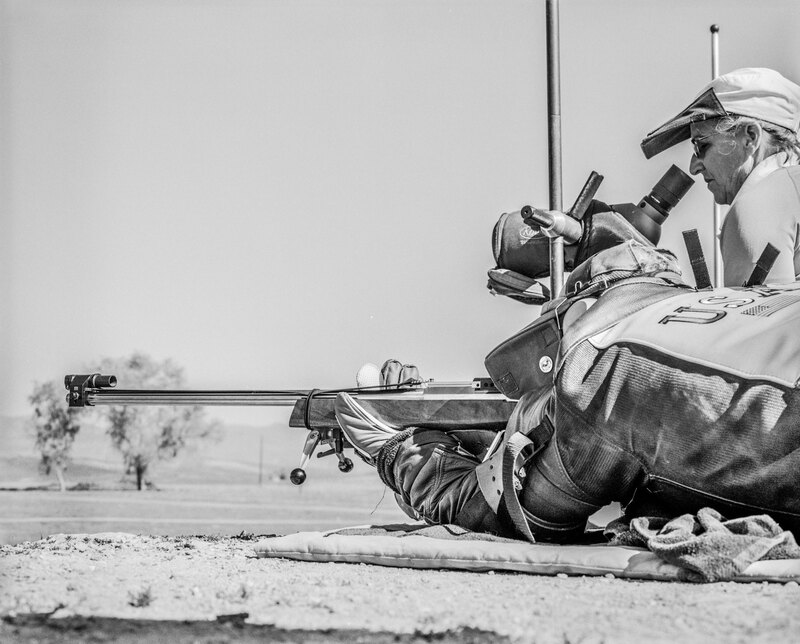 The Fullbore Course-Of-Fire for this match was squadded on the first day by classification for 15-shots string-fire at each yard-line: 300 / 600 / 900 / 1000 yards. 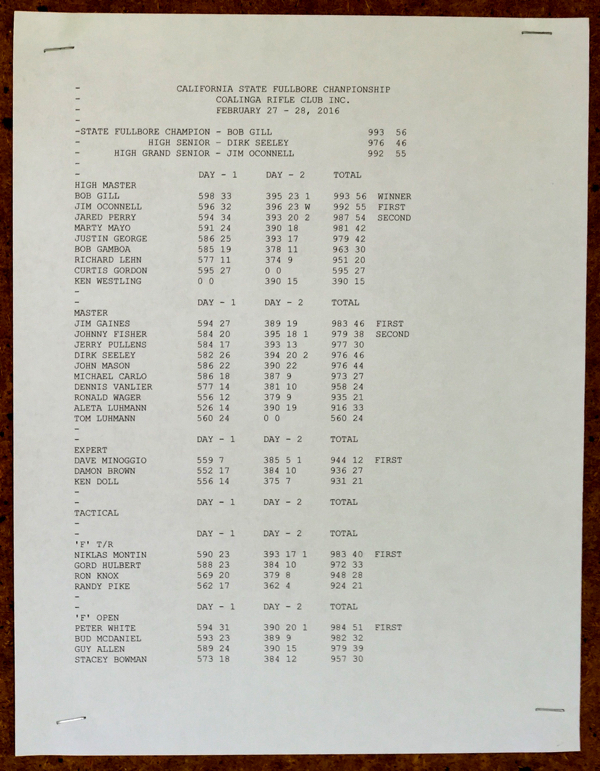 These scores were then used to determine “two to the mound” squadding for the second day, when each competitor pair-fired with his closest competitor, and also kept score in between his own shots. 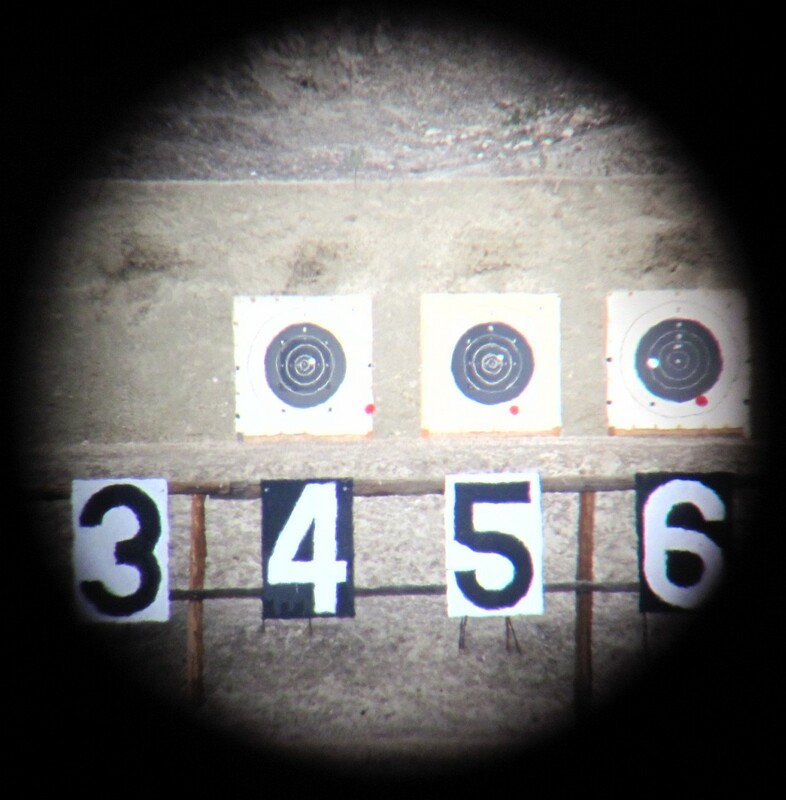 In this “pair fire” arrangement, only 45 seconds are allowed between shots after a shooter accepts his shot score. This forces competitors to shoot through condition changes as opposed to waiting for a more favorable pattern. 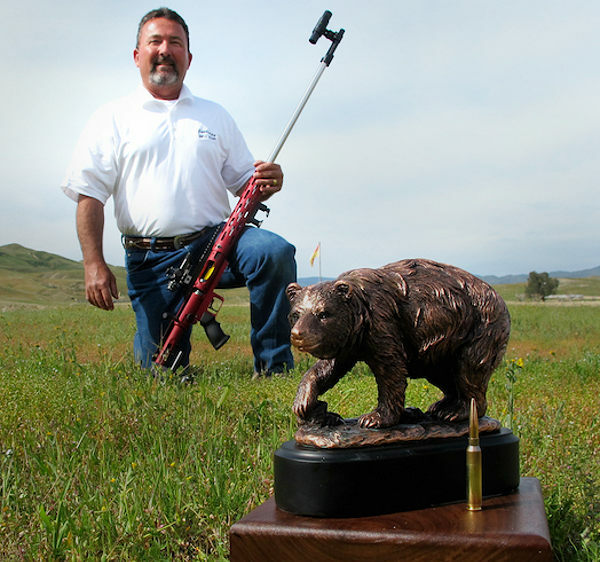 Share the post "Bob Gill Wins CA Fullbore Championship with .223 Palma Rifle"
One of our readers, Joshua Targownik, is a very talented photographer. 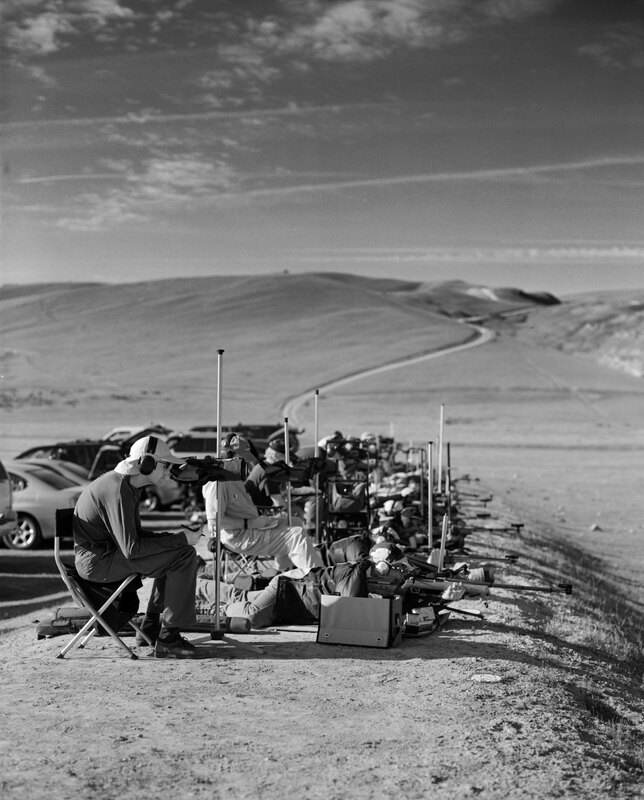 Last year he captured an evocative series of photos at the 2013 California State Palma Championships, hosted at the Coalinga range. Joshua reports: “I shot all these images on good old-fashioned medium format black and white film”. We like Joshua’s images — they have a classic “old school” look which seems to suit the Palma (Full-bore) discipline. 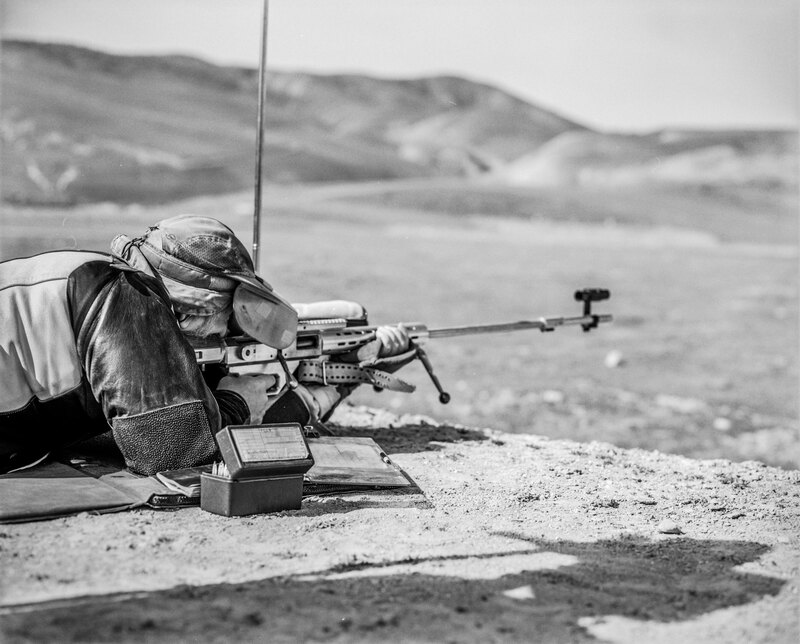 The black and white photography seems appropriate to the world of iron sights, leather shooting coats, and “hard-holding” marksmen. Images by Joshua Targownik. To see more of Joshua’s photos, visit TargoPhoto.com. CLICK HERE to View Full PHOTO GALLERY (17 images). 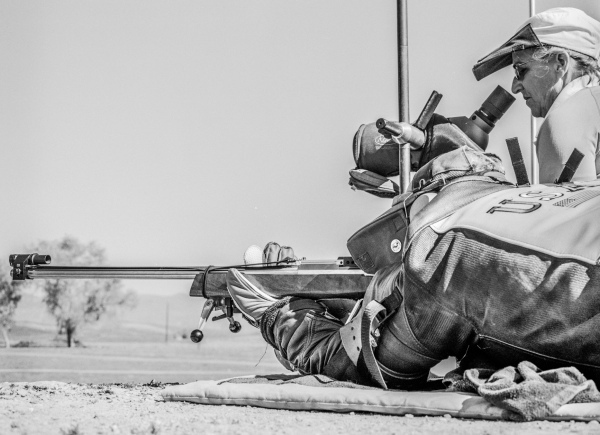 Share the post "Profiles of Palma: Classic Images from CA LR Championship"
Next month, the California Grizzlies Junior Rifle Team will head to Camp Perry to compete in the NRA High Power National Championships. Those of us here in California are very proud of these young shooters, who topped the USAMU in last year’s “6-Man Rattle Battle”, the National Infantry Trophy Team Match. 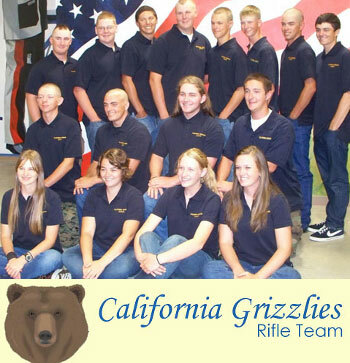 Using rifles fitted with “bullet buttons” or other devices rendering their AR15s compliant with California’s draconian gun laws, the Grizzlies have managed to become one of the nation’s top junior teams, despite the misguided efforts of California politicians to ban AR-style rifles. The California Grizzlies Junior High Power Team currently consists of 15 juniors who are from different parts of California. 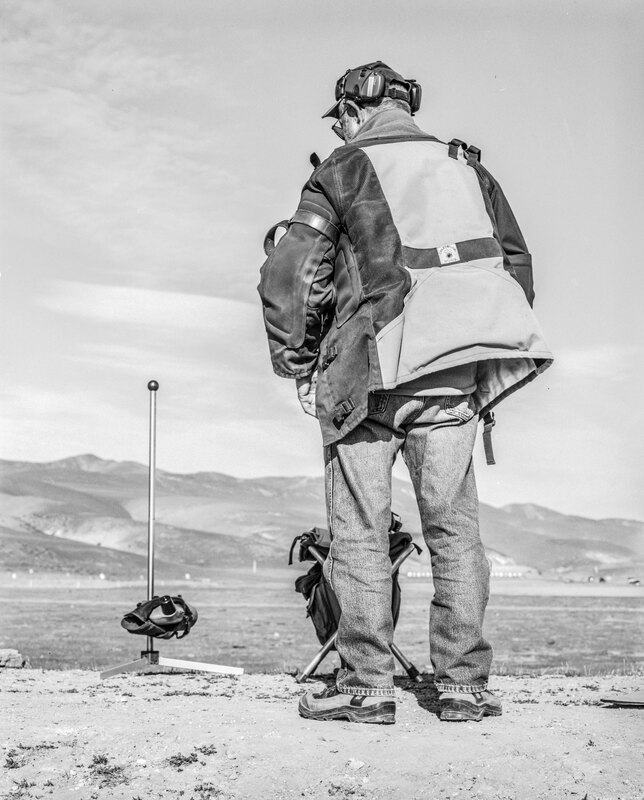 The team is open to NRA High Power-classified California youths between the ages of 13 and 20. 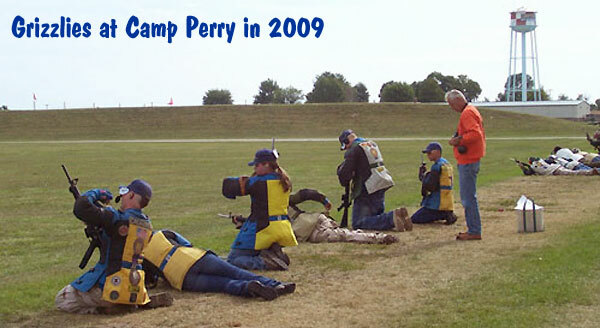 The California team has the privilege of competing in the National Rifle Matches at Camp Perry, Ohio every August. Shown below are team members at Camp Perry last year, with coach Jim O’Connell (orange sweatshirt). 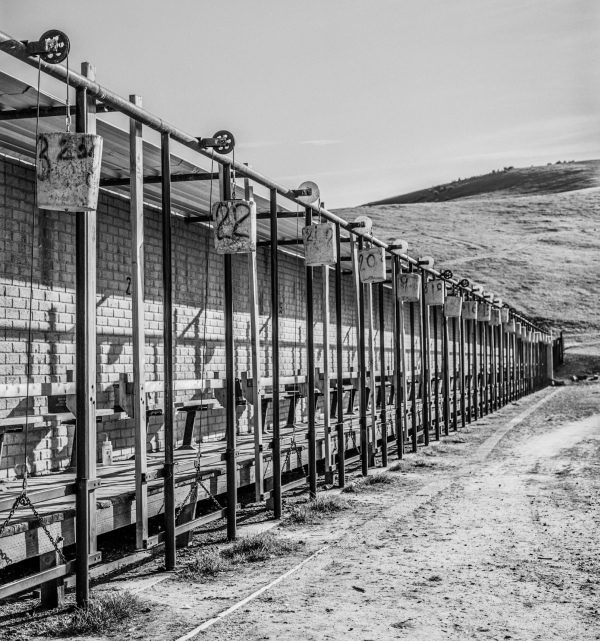 The video below was filmed in June, during an intensive, week-long training clinic held at the Coalinga range in central California. During the clinic, Grizzlies members honed their position shooting skills in preparation for the 2010 National Championships. We wish these boys and girls good luck in their quest for another big win at Camp Perry. Thanks to Steve of The Firearms Blog for first writing about this video. Share the post "California Grizzlies Junior Team Readies for National Matches"